Space Hoppers by Mark Brake - spacekids - space toys, dressing up costumes, kids spacesuits, astronaut food, cool space stuff! 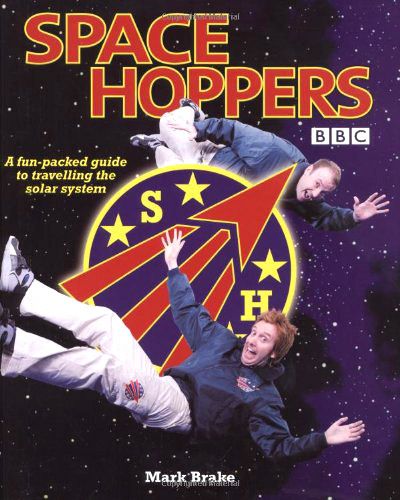 Space Hoppers is based on a BBC TV series starring Dan Wright and Steve Marsh, the comedy duo known to Cbeebies viewers and their parents as the hugely successful Big Cook, Little Cook. In the book Dan and Steve help us explore the Sun, ice, volcanoes, comets, extreme weather, extreme distances and water on earth and in the solar system. It is packed with experiments that you can do at home too. Author Mark Brake is a freelance scholar, working out of the UK, who writes popular science books, and has done science communication work in film, television, print, and radio on five continents. He has communicated science for NASA, Seattle's Science Fiction Museum, the BBC, the Royal Institution, the British Association for the Advancement of Science, Nature, the British Council, and the National Science Museum of Thailand. Mark is perhaps best known for his work in popularising the relationship between space, science and culture.